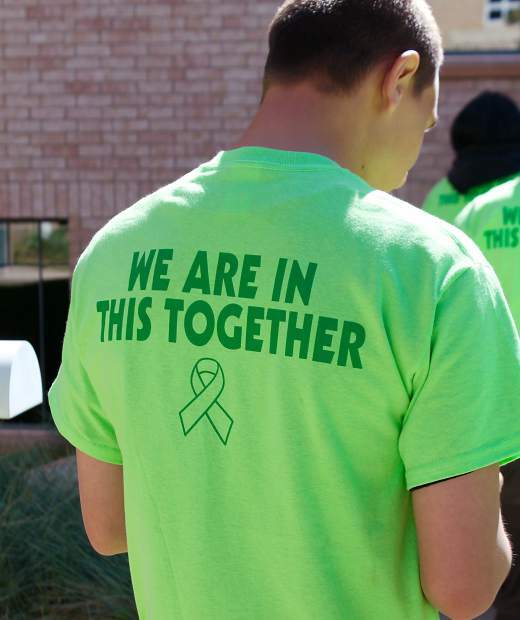 A participant in the Eagle County Changing Minds parade sports a T-shirt proclaming that mental health awareness and outreach is a communitywide concern. EAGLE COUNTY — During the past year, local leaders have highlighted the lack of mental health services in Eagle County and local voters have passed a tax on retail marijuana purchases to fund mental health programs. Now it’s time to make something happen. “As a community, we know this is a problem, and we are going to quit just wringing our hands over it,” said Eagle County Commissioner Kathy Chandler-Henry during a meeting last week with representatives from the Hope Center — an aptly named organization that the county has reached out to as it builds an entirely new mental health support network. The Hope Center is marking its eighth year of operation in the Roaring Fork Valley. The program features a model that operates in partnership with law enforcement services and community resources. “We bring the services to the person. We will meet people on ski hills, if that is what is required,” said Hope Center Director Michelle Muething. Under the Hope Center model, a crisis clinician screens every potential mental health 911 or suicide hotline call to determine risks, safety and need. Muething noted that typically, within five minutes of launching a screening, the clinician knows whether or not to send help to the caller. If help is needed, law enforcement or emergency medical personnel can be sent out, followed by a clinician shortly thereafter. “The goal is for a law enforcement officers to secure the scene and make it safe. Our goal is then to say ‘Thank you very much’ and start services,” she said. Muething said bringing mental health professionals to patients in crisis is a much more compassionate and effective practice than transporting patients to a hospital, which may not be equipped to treat their issues, or to a jail, where they do not belong. “Home can be just as safe as an emergency room, with the right support,” Muething said. And, she stressed, treatment at home results in a huge cost savings for the patient and for local law enforcement and EMS. Emergency room visits are pricey, as is emergency transport, Muething said. When someone is suffering from depression or experiencing a bipolar crisis, that person need counseling, not emergency room triage. “Law enforcement and emergency transport become taxi services, and it’s not what’s needed,” she said. Once a clinician has made contact with a patient, the Hope Center model feeds community resources by connecting local therapists with people who need their services. That means people move from crisis response to longer term treatment. If costs are an issue, then the center helps subsidize treatment. But while an in-home crisis response can save money all around, Muething noted that medical services and insurance benefits aren’t really set up to recognize that economy. But even with its financial challenges, Muething said the Hope Center is making a strong positive impact in the Roaring Fork Valley. She noted last year the center served 760 new clients, helped 38 people successfully complete a stabilization program and assisted 15 patients in finding Front Range hospitalization services. Additionally, the program trained 1,098 people in suicide awareness. She also shared the Hope Center’s more important statistic — since it started working with people through both crisis response and ongoing treatment, it hasn’t lost a single patient to suicide. “Most people don’t want to die. They just don’t want to live the way they are living,” Muething said. As it looks to expand into the Eagle Valley, the Hope Center has proposed a model that would operate local services as a satellite to its Roaring Fork organization. The local services would be overseen by a committee from Eagle County. The first-year expenses are estimated at $730,000 and would cover the costs of a full-time director, an intake coordinator and three crisis clinicians. Eagle County Paramedic Services has already pledged $100,000 toward the effort, along with offering office space. Additionally, a private donor has pledged $50,000. As the commissioners noted, that leaves a $580,000 funding gap. Muething said additional funding could come from partnerships and contracts with emergency services. And, naturally, the county’s Total Health Alliance (marijuana tax) dollars could be tapped. During the course of the presentation, the commissioners voiced their enthusiasm for the Hope Center model. “We are really trying to figure out how to build a mental health system from the ground up,” Commissioner Jill Ryan said. She noted as the county works to put its plan in place, the in-home care model, mental health school counselors, respite care and support services at the county jail are all priorities.